Although winters in Chattanooga, Tennessee are not "arctic" by any stretch of the imagination, Neither am I a polar bear. You'll notice that this page is titled "comfort" not "survival in pain"! Riding my Helix scooter at ANY speed - let alone at highway speeds of more than 50 mph - when the temperature drops below freezing, brings on wind-shill physiological temperatures equivalent to the artic itself. So I looked for "Arctic" in Ebay and found these USAF surplus pants. They are not a perfect fit; marked "40" they would fit someone six feet tall so even hiked up above my waist, they are a bit too long. But that is not a serious problem since I didn't buy them for hiking. Those "shop weight" suspenders from Sears are needed since I do not have the coat these pants are meant to snap onto. The suspenders also allow me to take up some of the excess length, which as it turns out, makes the pants well-adapted for riding the scooter! The pants have zippered legs which open enough to fit over my motorcycle boots, so getting into or out of the pants is not impossible, although it can be a bit of exercise. At 6 pounds their weight is not a burden, especially considering that I am usually sitting down while wearing them. They have numerous pockets with heavy-duty zipper closures and similar openings on both side giving access to my inside pants pockets. 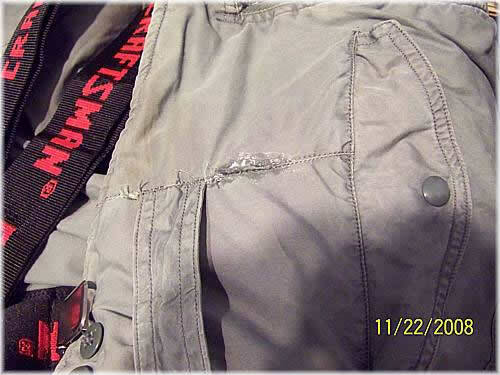 The frayed seam was "welded" with an injection of "Marine Goop." Past experience proves that even after many washings, this stuff remains flexible and impossible to remove. 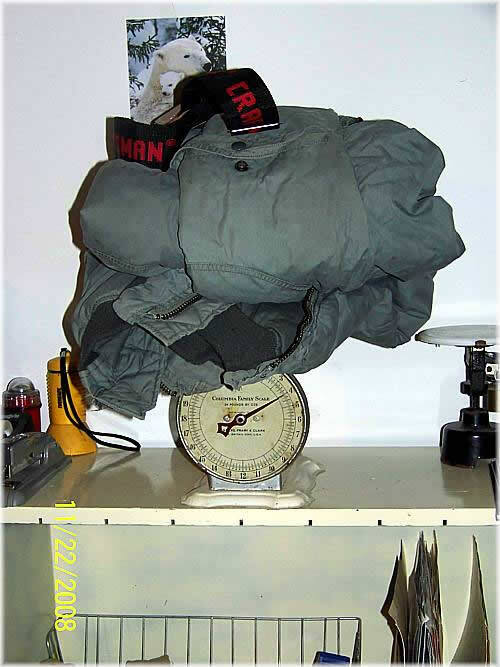 If you want to ride this winter in a reasonable degree of comfort, military surplus artic wear is a good place to look for a bargain. 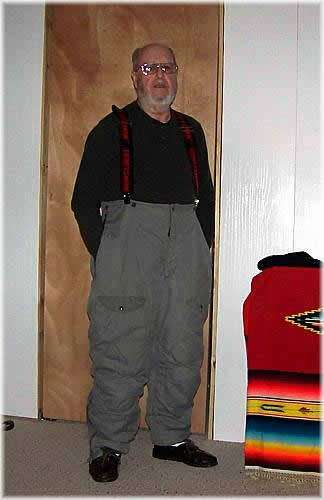 Of course, similar clothing is available from any snowmobile or far-north ooutdoor adventure shop - at twenty times the cost! ©2006 Bill Laudeman; all rights reserved. Page updated Saturday, November 22, 2008 21:24 Eastern time.